Last week, volunteers across the country searched for people surviving without shelter for annual Point In Time counts. Many communities take weeks or even months to report their count data, but King County shares its numbers just a few hours after its One Night Count, which was Jan. 29 this year. Waiting for the results that rainy morning, I braced myself for the number to be up from 2015, when 3,772 people were found sleeping outdoors without shelter in King County. I expected an increase because research shows that when the average apartment rent goes up by $100, homelessness increases by 15 percent in urban areas and 39 percent in rural or suburban areas. In King County, the average monthly apartment rent shot up by $115 in the last year, according to All Home. Still, I was unprepared for the number of people who were counted without shelter that morning: 4,505. It was a 19 percent increase from 2015. 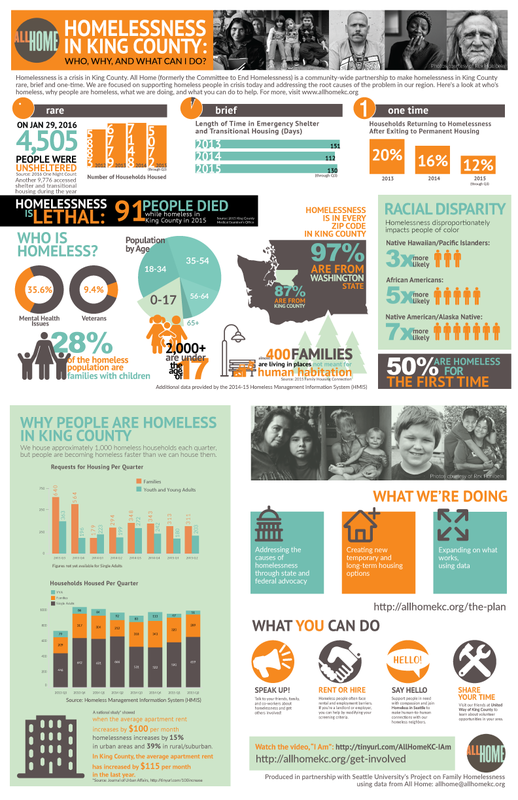 All Home and Seattle University Project on Family Homelessness created this graphic to share data about homelessness in King County. Designer Amy Phung wrote a thoughtful blog post detailing the emotional experience of putting this graphic together. Still processing the One Night Count. It hurts to see so many of my neighbors in such vulnerable places. That morning, I joined other advocates outside Seattle City Hall for a solemn gathering organized by Real Change. Many of us were overcome by emotion when word of the count results spread. It was heartbreaking to know that 4,505 of our neighbors, friends and family members had no other option than to sleep outside on a cold night. I exchanged a long, tearful hug with my friend Susan Russell. She knows firsthand how dangerous it is to live on the street. As Susan and others took turns sounding a gong 4,505 times, I interviewed advocates Tsukina Blessing, Mellie Kaufman, and Linda Soriano. They spoke about the perils of sleeping without shelter, and the moral imperative to get our neighbors into safe, stable homes. Their words, combined with the haunting rings of the gong, clearly touched our community: Since I posted the video on Facebook last Friday night, it has been viewed more than 6,000 times, and re-posted by more than 150 people. 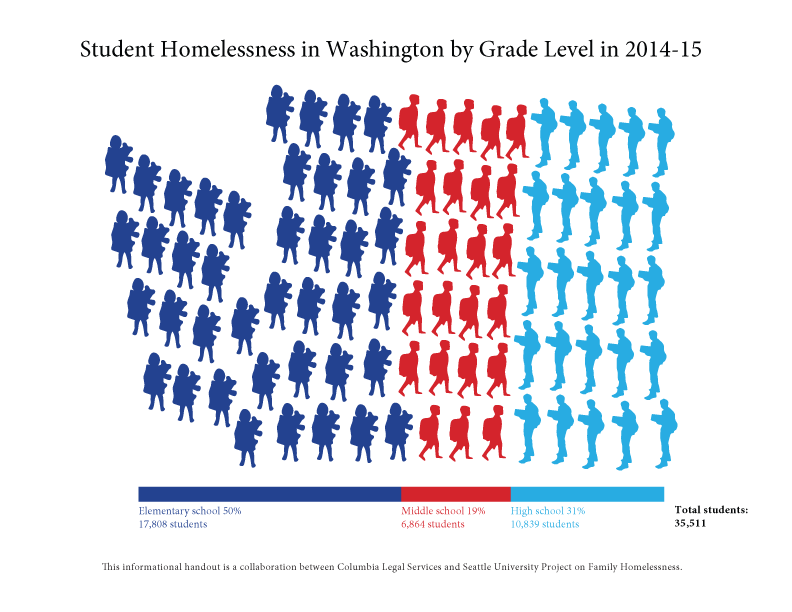 The Point in Time count of people sleeping on the streets Snohomish County revealed a shocking 54 percent increase over last year. As distressing as these numbers have been, I’ve also seen some cause for hope. Our statewide housing crisis is upsetting and even daunting, but we can come together to solve it. First we cry, then we take action. Share stories about homelessness, including our video about One Night Count results and StoryCorps “Finding Our Way” stories, with your friends, family and policymakers.